The final step in our Weicon Crack Testing Dye Penetrant Flaw Identification System. A fast acting, easy to use developing spray that makes any surface flaws, cracks or fissures identifiable. Reliable flaw identification for critical components. Our Weicon Crack Testing Agent – Developer Spray is the final part of our Crack Testing Dye Penetrant Flaw Identification Kit. 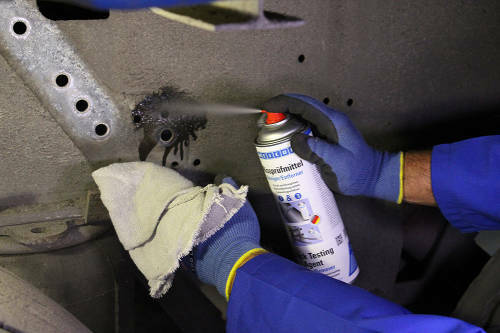 It is sprayed on after any excess penetrating spray has been cleaned away. Once sprayed, the Developer will create a white background surface while cracks, flaws or problems will remain red. 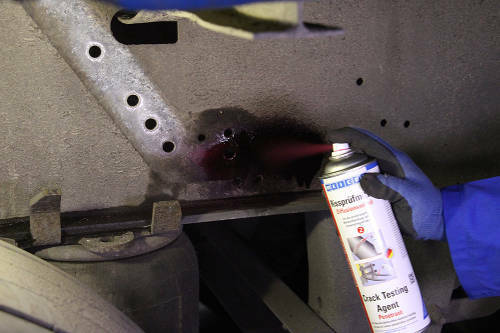 Our Crack Testing Developer Spray only needs to be used sparingly and is very effective. In fact, too much can cause issues as very tiny cracks may be covered by the developer making them hard to spot. This easy to use spray, when used in conjunction with the rest of the Weicon Crack Testing Kit, will allow you to easily spot small fissures, cracks and flaws in all kinds of surfaces. This kit has been designed to work well with a variety of different materials including metal, welds, ceramic and most types of plastics. We are happy to offer this part of our Crack Testing Agent Kit individually (via this page) or as part of the kit. 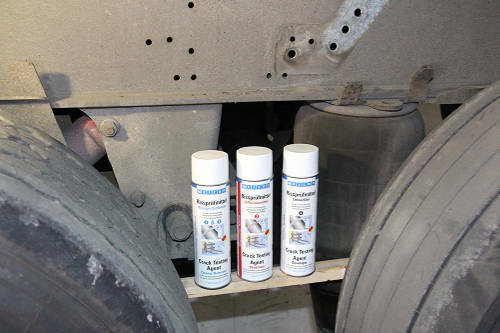 The other two components (Cleaner and Penetrant) are also available individually if you do find yourself going through them at different rates. Links to both are included below.